Dyson is one of the most renowned and respected vacuum cleaner brand that has been catering to the diverse cleaning needs of its customers for more than 25 years. The brand offers a wide variety of vacuum models suited for both residential and commercial needs. Among these different models of vacuums cleaners, the V6 and V8 are gaining immense popularity due their various features and functionalities. In order to help the buyers make an informed decision about choosing the most appropriate device as per their needs, discussed below are the details about both these models and their suitability as per different cleaning needs. Dyson V6 is essentially the remodeled version of the Dyson C59 Animal and while the new version comes with lesser attachments, it is also considerably low priced than the C59 Animal. The V6 is an extremely lightweight, cordless stick vacuum that features the cyclonic technology. The appliance is designed to offer the same cleaning power and efficiency as other bigger vacuums from the brand although in a relatively smaller and easy to move around body. 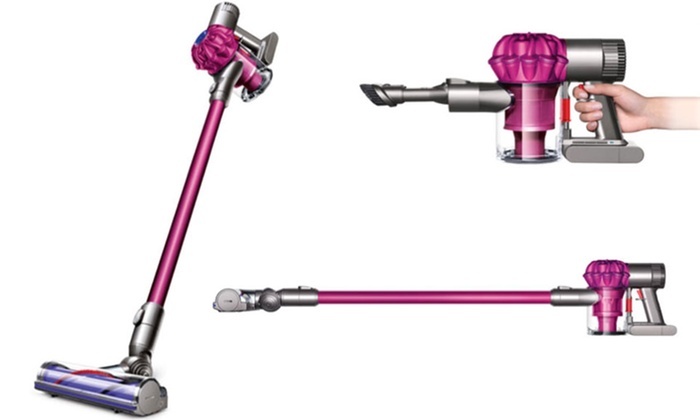 Made available in a variety of extremely bright and appealing color combinations, the different devices that are a part of this series of vacuums from Dyson are known to offer great cleaning flexibility and ease of operation. These vacuums are designed to create a great first impression of a stylish looking modern device. They also feature simple design changes that not only enhance the functionality of the cleaners but also make them more user-friendly. The most important of these is the power button which operates with the help of a hold down trigger system to ensure that the appliance is not left running unnecessarily. The devices also feature a long arm attachment which makes it quite simple to clean the hard to reach places quite efficiently. The devices are provided with ample accessories to carry out diverse cleaning tasks. Each attachment fits seamlessly either directly with the cleaner body or at the end of the meter long rigid attachment. 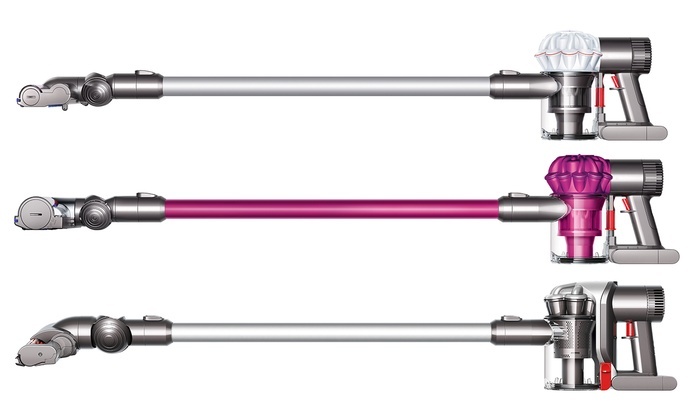 This feature ensures that the Dyson V6 Absolute, like other cleaners in the series, can easily be turned into a handheld vacuum within a matter of minutes. The neat wall mounted docking facility not only provides a convenient way to store the vacuum but also charge it for the next usage besides also holding two cleaning attachments. However, Dyson V6 is a device suitable for smaller home cleaning tasks only or to be used as a secondary vacuum with a larger, more powerful appliance. This is because the V6 features a relatively small dust cup having a capacity of no more than 0.4 liter and has a power backup of only 20 min. So, despite its powerful cleaning performance, the V6 is not the perfect primary cleaning device large houses although it definitely proves to be the best option for small homes and apartments. Dyson V8 is an extremely powerful and durable vacuum cleaner that offers noiseless performance at a rapid pace. Just like the V6, the V8 is a cordless stick vacuum that is lightweight and easy to store. However, the V8 is considered by many to be a better of the two Dyson vacuums as it offers the functionality and features that stand way ahead of what V6 has to offer. The most important of these is the improvement in its dirt disposal mechanism. The users simply need to press a button to make the to empty the dust bin of the V8 by lifting out the entire filter, which is unlike the need to remove the filter lid manually. The V8 is features a digital motor capable of producing at least 20% more power. In addition, the max power button, which is extremely helpful in removing deeply embedded dirt and grime, is provided in the slide switch style, making it relatively easy to use. The provision of HEPA filtration system further enhances the cleaning performance of the device besides making it safe to use around people prone to allergies. One of the biggest advantages offered by Dyson V8 is that it is capable of handling diverse cleaning tasks with absolute ease and finesse. A larger capacity dust bin along with almost double power back up as compared to the V6, makes it suitable for cleaning even large spaces. The V8 comes with a variety of attachments that make it a comprehensive cleaning device. These include the direct drive cleaner head, the soft roller brush, soft dusting brush, crevice tool and mini-motorized tool etc. They prove extremely helpful in cleaning surfaces ranging from delicate carpets and furniture upholstery to the tight nooks and corners which are quite difficult to reach and even more difficult to clean. 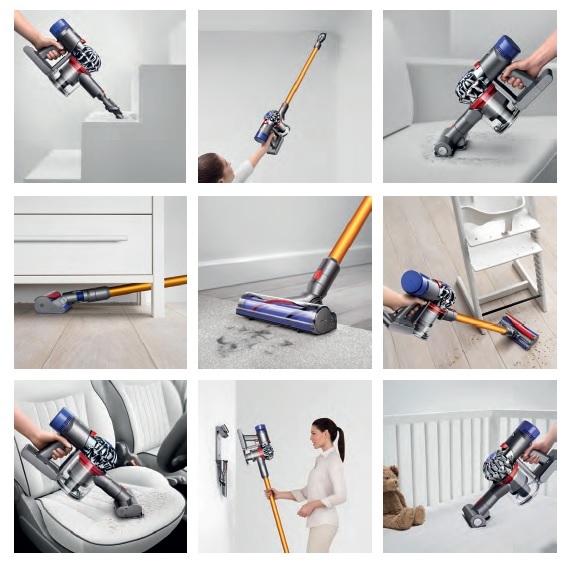 All these features combined together make Dyson V8 a clear winner hands down, especially for people seeking powerful cleaning performance across different surfaces.